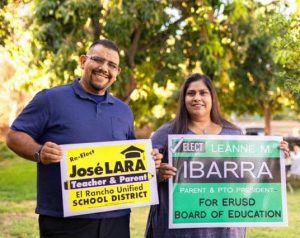 In what can only be understood as major victory for independent community-based politics in the Los Angeles suburb of Pico Rivera, two candidates backed by Unión del Barrio, Jose Lara and Leanna Ibarra, won the El Rancho Unified School Board election on Tuesday night. Securing the two top positions among a field of six candidates, Lara and Ibarra together won over eleven thousand votes in Pico Rivera, and will serve the community of Pico Rivera for the next four years. Final election results from 11/07/2018. This was a major victory for the students, parents and community of Pico Rivera, not only because they won the election, but also because this victory will effectively bring an end to the attacks they endured when their teachers and principals were fired by reactionary school board members. The Lara/Ibarra electoral victory of last Tuesday ensures that the progress that was made in improving schools in Pico Rivera will continue for at least the next few years. 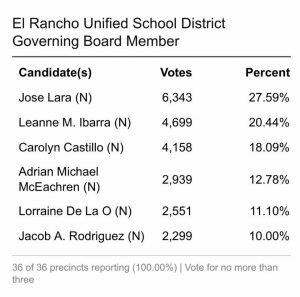 For months before the election, repressive El Rancho Unified School Board members held a majority of decision-making power within the school board, and used it to attack and ultimately fire ethnic studies teacher and Unión del Barrio compa Guadalupe Carrasco Cardona. Despite excellent job performance reviews, and the absolute support of her students and their parents, Lupe was abruptly dismissed during the Spring semester of the last school year. Her dismissal was retribution for her unwillingness to sell-out her ethnic studies curriculum, and for her after-hours political work with Unión del Barrio and the Association of Raza Educators. This was incredibly ironic because El Rancho Unified was the first school district in the State of California to implement an Ethnic Studies high school graduation requirement. Lupe Carrasco, in her classroom. Image from <https://www.gustavoarellano.org>. 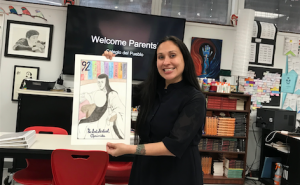 Lupe had been teaching the popular Ethnic Studies class for parents when the reactionary school board President suddenly shut down the class and accused Lupe of promoting the “communist indoctrination” of parents and community members. 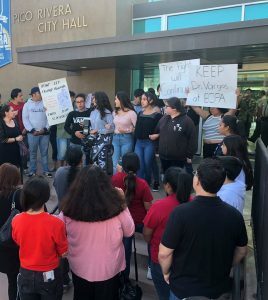 As increasingly large numbers of students, parents, and community members rallied to support compañera Lupe, Unión del Barrio joined the community to take their complaints directly to the El Rancho School Board meetings. At those school board meetings the reactionaries on the board were exposed when they publically aligned themselves with local and outside Trumpista agitators by silencing students and minimizing the concerns of the community. Radical white nationalists and their school board puppets openly ridiculed local students and their parents. One of the parents they disparaged was Leanne Ibarra, a Pico Rivera mother who was also a key community leader who supported Lupe. It was not until Leanne witnessed the arrogant and hateful behavior of the Trumpista reactionaries, that she decided to take local power into her own hands and run for the school board herself. Students and parents rally in support of their teacher and principal. Local Trumpistas also decided to run for school board, threatening retribution against anyone who dared say anything critical of Donald Trump, the government, the police, the migra, etc. 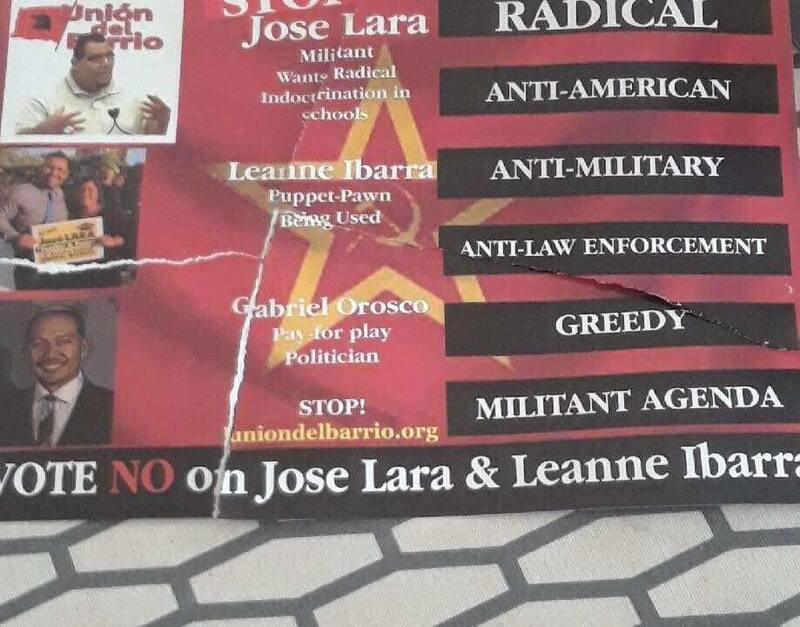 These Trumpistas ran a filthy campaign were they tried to “red-bait” Jose Lara and Leanne Ibarra (“red-baiting” is attacking people as communists). Hoping to scare the residents of Pico Rivera, they passed out hateful flyers and posted banners throughout the community with the message “No Marxists in ERUSD”. Their other negative attacks included mass text messages, constant online harassment, several newspaper “hit-pieces” in Trumpista rags, and even stalking the homes of Lara and Ibarra supporters. 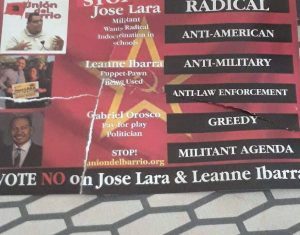 Red-baiting Trumpista flyers handed out to attack Lara and Ibarra. Lara and Ibarra did not fall under the influence of Trumpista political poison. Lara and Ibarra maintained a respectful and intelligent outreach plan intended to connect with students, parents and the community. They had disciplined, focused, and well-organized campaigns; true grassroots efforts that worked hand-in-hand with the community. Parents walked precincts, students walked precincts, and the campaigns were run out of a local teacher’s garage. 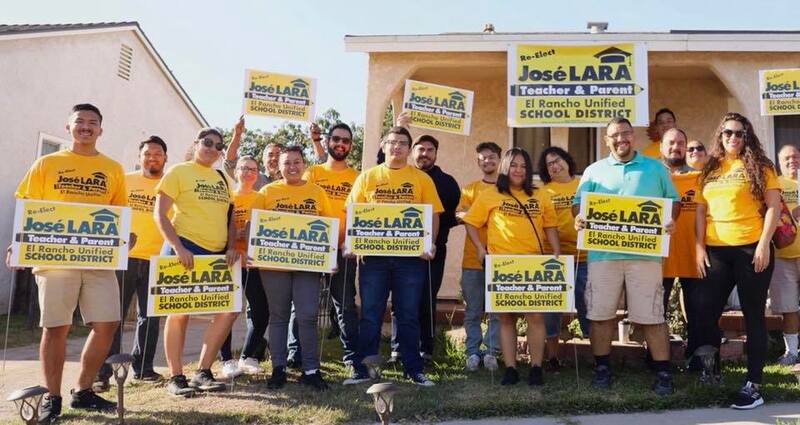 On election day it immediately became clear that the Trumpista attacks had utterly failed, the vast majority of the Pico Rivera electorate had expressed its support for Lara and Ibarra, and Pico Rivera students and parents alike were on the side of the community work that has been led by our organization for decades. Unión del Barrio is one of the few raza-led grassroots groups that has helped secure an electoral victory like this one since La Raza Unida Party set the standard for electoral struggle during the Chicana/o movement of the 1960s and 1970s. Unión del Barrio is not now, nor will we ever be an electoral party, and we reject both the Republican and Democratic parties as two heads of the same diseased animal. But we also know that we must lead in every political space we possibly can, including within electoral struggles. Lara and Ibarra represent one small school board victory, although we know that this victory is extremely meaningful for the movimiento, and we anticipate many more victories in the future. We will continue to build, recruit, and advance our movement, especially now that Trumpistas everywhere, from Washington D.C. to Pico Rivera, are all on a mission to attack anything having to do with Mexicans and La Raza in general. Not a day goes by that Trumpistas don’t remind us just how much they hate our communities. We need to organize ourselves to defend our communities now! If you want to join our organization, please visit our website at www.uniondelbarrio.org and read our political program. Our contact information can also be found there. Original post, November 8, 2018. This entry was posted in 2018, Analysis, Analysis, Electoral Politics, En Español, History, K-12 News & Events, Local Community News & Events, Los Angeles News & Events, Organizational Updates, Statement. Bookmark the permalink.